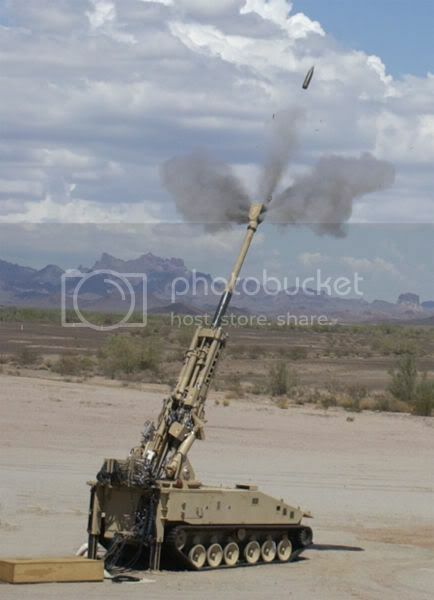 The BAE Systems Land and Armaments XM1203 Non-Line-of-Sight Cannon (NLOS Cannon) is a 155 mm cannon intended to provide improved responsiveness and lethality to the "Unit of Action" (UA) commander as part of the US Army's Future Combat Systems project. This mobile armored artillery piece provides networked, extended-range targeting, and precision attack of point and area targets in support of other combat units with a suite of munitions that include special purpose capabilities. The Non-Line-of-Sight Cannon provides sustained fires for close support and destructive fires for tactical standoff engagement. The NLOS Cannon uses technology from the cancelled XM2001 Crusader. NLOS-C is a proposed system in development to be part of the FCS (Future Combat Systems) environment and is funded by the U.S. Congress shortly after cancellation of the XM2001 Crusader M109 replacement. It is an 18 ton class vehicle that may be a replacement for current vehicle systems in the 40-60 ton weight class. If design parameters are indeed reached (always a question for systems in development) then it will provide a level of air transportability that current M-109 systems can not at present match. The system's primary purpose is to provide responsive fires in support of the FCS (future combat systems) Combined Arms Battalions (CABs), and their subordinate units in concert with line-of-sight, Beyond-Line-of-Sight (BLOS), Non-Line-of-Sight (NLOS), external and Joint capabilities. The initial loading must be done manually. It supports 72 charges, in 24 rounds. After initial setup, it can fire a shot in 6 seconds, fully automated loading and firing. As it is fully computer controlled, the precision is exact. It has a attached radar which tracks each projectile and can adjust the path of the next shot if needed. There is another peculiarity, it can fire 10 shots in 6 seconds, such that all 10 shots will reach a specific point at the same time, by changing the projectile height. Isn't it wonderful. Also, the expected weight is only 20 tonnes.